It can be tough to find a place to live. Especially in Detroit. Double-especially if you have bad credit. We all know how tough it can be to face rejection after rejection when you’re applying for a mortgage, but it doesn’t have to be this way. There are bad credit home loans in Detroit that are available to anyone who knows how to look for them. Get Help Pre Qualifying for a Detroit Bad Credit Home Loan – Click Here! The first step to finding a bad credit home loan in Detroit is understanding what Detroit mortgage brokers are looking for when they choose to approve or reject your loan. There’s two primary factors that lenders look at when they’re considering an application. The first, a FICO credit score, is determined by calculating the applicant’s payment history and credit utilization. If the applicant is regularly paying their bills and has low credit utilization, it creates a higher credit score. If you miss a lot of your monthly bills and aren’t paying off your debts, you’re going to have low credit, which means a lower chance of buying a home. The second primary factor that Detroit mortgage brokers and banks look at when they consider an application is the debt-to-income ratio. This is the percentage of an applicant’s income that is taken up by paying off their debts on a monthly basis. In other words, pretty much exactly what it sounds like. Most lenders want to see a debt-to-income ratio no higher than 40 percent. Now that you understand the two most important parts of a loan application, let’s talk about where you should be applying if you want to get a loan in Detroit with bad credit. Firstly: state, city, and federal government programs. 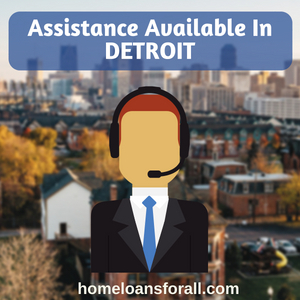 In addition to down payment assistance programs offered by the state of Michigan, the city has a mortgage program specifically designed for homes that are being purchased or renovated in Detroit. The “Detroit Neighborhood Initiative” will provide you with a no money down, low interest fixed rate mortgage on a new, existing, single-to-four family home, or condo within the city limits. The best part of this excellent program? Not only do DNI loans not have a minimum credit score, but credit is never even considered during the application process. You can learn more on the government’s website here, but suffice to say that this is one of the best bad credit home loans in Detroit. Many loan programs will make up for the lack of a low down payment by asking for high credit requirements or make up for low credit requirements with a huge down payment. 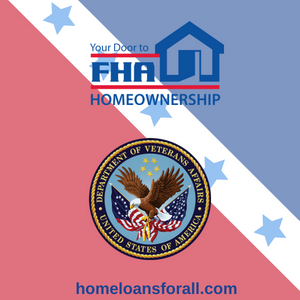 FHA and VA loans, however, combine the best of both worlds. Both of these programs are insured by branches of the federal government (the Federal Housing Administration and the Department of Veterans’ Affairs), so mortgage brokers in Detroit feel more comfortable giving out these loans to applicants they might otherwise reject outright. FHA loans are available to anyone and have no minimum credit requirement. However, your credit is still considered as part of the home buying process. If you have a credit score of 580 or higher, you will only have to pay 3.5 percent of the total value of the home as a down payment. If your credit score is lower, you may have to provide additional forms of credit like proof that you regularly pay your utility bills. In addition, applicants with credit scores below 580 will have to pay a higher down payment, usually up to 10 percent. However, that’s still only half of the 20 percent payment required by a conventional mortgage, so we still highly recommend this program to anyone who wants a bad credit home loan in Detroit. VA loans are a little more exclusive – they’re only available to eligible veterans and members of the armed forces. However, they not only have no minimum credit requirement, but they don’t require you to pay for private mortgage insurance or a down payment. This means that these Detroit bad credit home loans will save you thousands of dollars over the course of the mortgage! 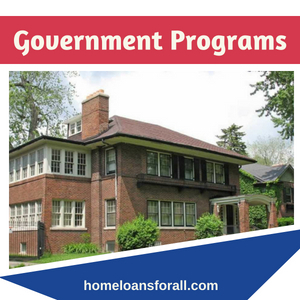 Any of these government programs can be a good way to find a bad credit home loan, but we recommend the FHA loan in Detroit above all others if you are a first-time buyer. FHA loans are designed for the specific needs of the first-time home owner and should be your first point of comparison. What if you really want a conventional mortgage? Or what if you’re still not eligible for one of the government programs? You may need to get a cosigner to help you find good terms on a bad credit home loan in Detroit. A cosigner lets you apply for the loan with their credit score (or at least with a boost to your own) which will get you better interest rates and a better chance of getting your application accepted. However, the cosigner also assumes much of the responsibility for the payments and agrees to tie their credit score to your property, so this can be a big risk if you’re not prepared to make all your mortgage payments on time. If you don’t feel the need to own a house right away and you’re still looking for a bad credit option, why not rent a house now with the option to buy it later? When you apply for a rent-to-own contract, you agree to rent a home for a specified period of time and will pay a fee up front for the option to purchase the home outright once the lease is up. Typically, a portion of the every rent payment you make is applied towards the principal of the home as well, which can then be applied to the purchase at the end. This option lets you live in a house now while you improve your credit and save up for the big purchase later. If that sounds like what you’re looking for, consider applying for a rent-to-own contract in Detroit. 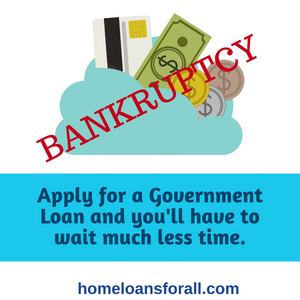 If you’ve ever had to file for bankruptcy in Detroit, it will impact your ability to get accepted for a bad credit home loan in two major ways. Firstly, it’s one of the most damaging events that can happen to your credit score. And secondly, conventional loans have a seven-year waiting period, meaning that you have to wait the better part of a decade between filing for bankruptcy and finding a new home to live in. The good news is that government loans have much shorter waiting periods. If you apply for an FHA loan – which most home buyers should be able to do – you can do so only three years after you file for bankruptcy instead of the full seven. VA loans are even more lenient with a two-year waiting period. And if you take those two to three years to start improving your credit with the tips we’ve outlined below, the terms on your eventual home loan will be even better. Improving your credit is a slow and difficult process that will take a lot of time and effort. That’s why we’ve tried to recommend other options that will allow you to find a house in the short term. However, there are a couple of steps you can take to repair your credit and you should do these things even while you’re applying for bad credit home loans in Detroit so that you can find more favorable terms on a mortgage. First, start paying your bills in full and on time every month. This can affect your credit a lot if done consistently because it shows potential mortgage brokers in Detroit that you’re good at making monthly payments. This in turn makes the lender feel like they won’t lose money if they give you a loan, which of course is their number one concern. Secondly, you should pay off some of your debt in regular intervals and take steps to lower your overall credit utilization. This improves your credit score a lot, but it also helps your debt-to-income ratio, which means that it’s one of the best things you can do to repair your credit and find bad credit home loans in Detroit. If you’re going to be securing a bad credit home loan in Detroit, you should make sure that you’re taking advantage of all the assistance available to you. HUD-approved counseling agencies are a good place to start, as is the Michigan State Housing Development Authority. 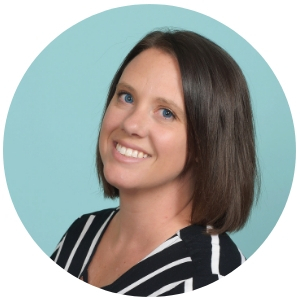 These organizations will sometimes host seminars and Q&As so that you can get answers to more technical questions than we’re able to cover in this article. The homestead tax credit allows you to withhold a certain amount of property taxes when you’re living in a Detroit home that you’re currently paying off. It’s a valuable savings, and a good example of some of the assistance that’s available to you even after you’ve secured a bad credit home loan in Detroit. 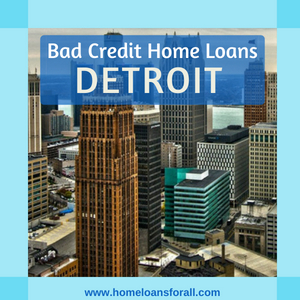 Now that you’ve learned a bit about the different options for finding bad credit home loans in Detroit, we hope you’ll be able to pick the one that’s right for you. Remember that you should always “shop around” to see the sorts of terms that are being offered by different money lenders so that you can find the best possible option. Looking for home loan help for single mothers in Michigan? Click here. Looking for low income housing for Michigan teachers? Click here.